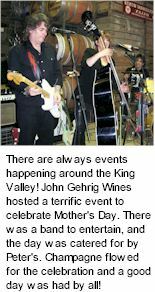 Chenin Blanc by John Gehrig of King Valley. A mid weight palate with effusive varietal fruits, canteloupe, grasses and nut. A consistent performer on the wine show circuit as it hails from a microclimate that is ideally suited to growing Chenin Blanc grapes with vibrancy and distinctive varietal characters. John Gehrig has a passion for winemaking that stretches over sixty years, he learned the craft from his father and established his own vineyard in 1976. The perfect complement to seafood and spicy Asian dishes, John Gehrig can be enjoyed with a wide range of foods or as an aperitif to stimulate the appetite. John learned his trade from his father. John spent sixteen years working on the family estate before a three year exposure to commercial and retail business whilst actively pursuing a vineyard investment. He has a passion for wine that stretches over 60 plus years (not giving too much away!) and can tell you many a story about his experiences in the wine industry over that time. Since 1976 John and Elizabeth have realised their ambitions. Cellar sales commenced in 1981 and fourteen acres are now under vine, producing most of their grape requirements. Their modern family operated winery is designed for a 70 tonne grape crush. The vineyard is planted to Rhine Riesling, Chardonnay, Chenin Blanc, Sauvignon Blanc, Pinot Noir, Cabernet Sauvignon, Merlot and Muscat and is watered by a trickle irrigation system. A grafting programme has ensured that half of the vines are on their own roots, with the other half grafted onto American root stock to offset the danger of phylloxera infestation. Between February and May the grapes are harvested. The practical size of the vineyard allows for hand pruning and picking which assists in the production of premium wines. There are certainly a wide variety of quality wines to choose from at John Gehrig. The chosen varietals all suit the climates surrounding the Gehrig vineyards of northeast Victoria, the finished wines exhibit full fruit flavour across the whole range. Enjoy! The winery is open to the public for sales and tasting seven days per week. A pretty all weather barbeque area on the King River has been established for small winery groups and buses. With prior notice, inspection of the winery can also be arranged. John is now semi retired, and can still be found poking around the salesroom where he's more than happy to have a chat and show you around. His geese and ducks are his new hobby, and if you're lucky to come around feeding time it's a sight not to be missed! 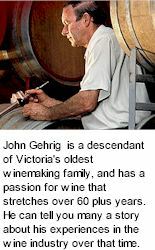 John and Elizabeth Gehrig have four children, who have all inherited the love for wine from their parents. Andrew, Jane, Ross and Victoria all share the passion of wine that is now 5 generations old. Youngest son Ross took the reins as winemaker after finishing his Wine Science degree, and multiple vintages in France and Israel. He continues the vision that John and Elizabeth had, while adding his own special touches to it. Ross has introduced an RG range of wines, these are wines that have won medals in the wine show system, and Ross believes show true varietal character and top quality.